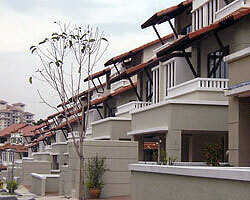 Taman Seputeh was developed into a residential area in the 1970s, and housing developments continue to go up in the area. The very new guarded enclave of Mutiara Seputeh, consisting of 80 3-storey semi-detached units and a dozen 3-storey bungalows, is set on 15 acres of Bukit Seputeh. Not far from it is a large Chinese cemetery with a lovely view of the city below (and a reputation for being haunted) and the Tien Ho Temple, a popular destination for worshippers and tourists, especially on the weekends. Seputeh also has Hindu places of worship, including the Sri Shamundeswari Temple in the neighbourhood of Desa Seputeh. Another newly developed and very exclusive neighbourhood is Sierra Seputeh, a gated community with 54 semi-detached units and 4 bungalows on Bukit Robson. There are quite a few condominiums in this area as well. The Seputeh district is also the location of Kuala Lumpur's major shopping destination, the Mid-Valley Megamall, one of the country's biggest shopping complexes.